Stay up-to-date with everything going on at DreamPort. We are happy to share all the latest news and upcoming events. March 27, 2019 — Captain Ed Devinney, USN, generously presented a flag from the USS COLE and commemorative plaque to Karl Gumtow and the Maryland Innovation & Security Institute's DreamPort Facility on March 27th, 2019. 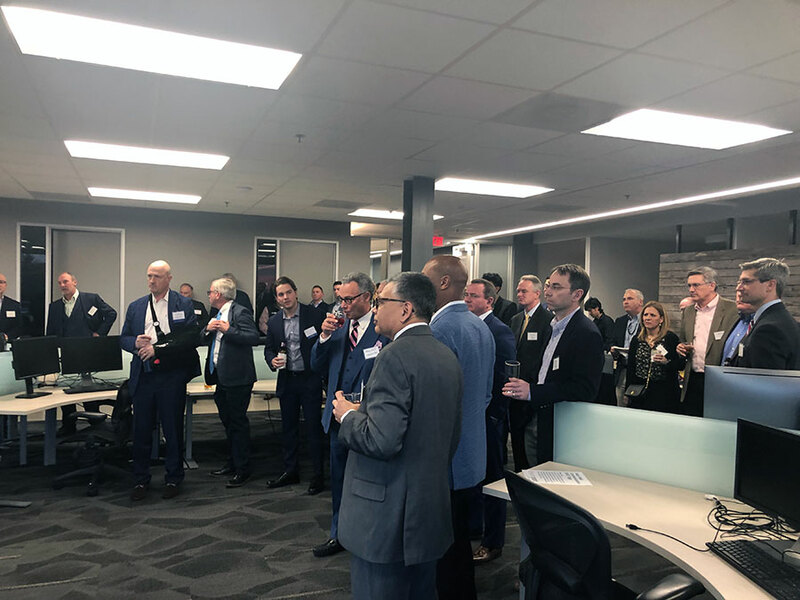 March 19, 2019 — DreamPort hosted a CEO Networking Event sponsored by COPT to provide the tech CEOs from the area information on MISI and the Dreamport mission. COPT invited many of their customers. Captain Ed Divinney made remarks on the concept behind Dreamport and the rapid pace of activity since its opening in December 2018. 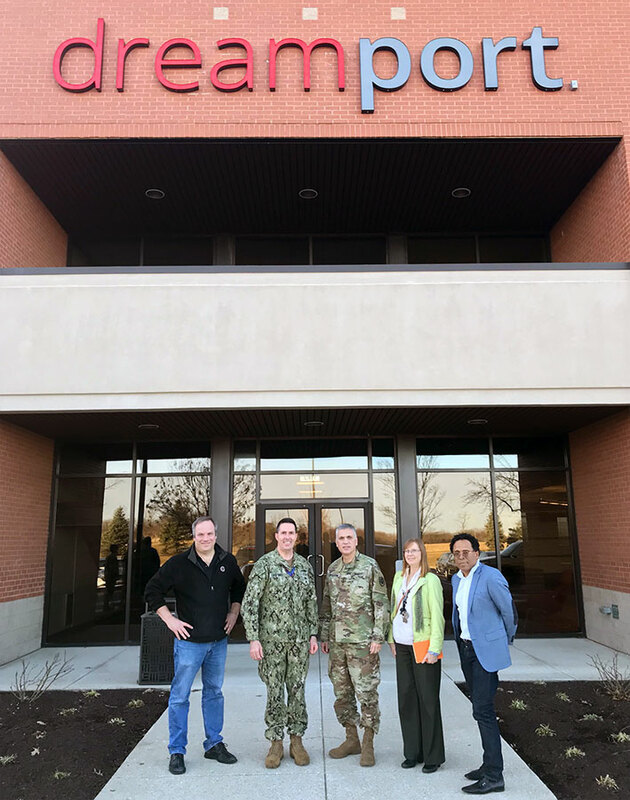 March 13, 2019 — General Paul M. Nakasone, Commander, U.S. Cyber Command and Director, National Security Agency/Chief, Central Security Service visited the DreamPort facility for a briefing. November 2, 2018 — U.S. Cyber Command tracks and confronts some of the most dire cybersecurity threats facing our country. But it needs a little help sometimes, so there is a new facility in Maryland dedicated to seeking private industry input on government cyber problems. October 26, 2018 — A new public-private partnership recently concluded its first hackathon-type rapid prototype event to help discover new techniques or tools that can be applied to problems or challenges facing U.S. Cyber Command. September 7, 2018 — U.S. Cyber Command is standing up a cyber version of SOFWERX, the public-private partnership run through Special Operations Command to foster greater innovation for rapid solutions. DreamPort, run by the Maryland Innovation and Security Institute through a partnership intermediary agreement with Cyber Command, is described as a state-of-the-art facility where companies can bring in their capabilities to be worked on. COLUMBIA, Md.--(BUSINESS WIRE)--Corporate Office Properties Trust ("COPT" or the "Company") (NYSE: OFC) has executed an 18,000 square foot lease with The Maryland Innovation and Security Institute ("MISI") in the Columbia Gateway Business & Innovation Center in Columbia, Maryland. June 19, 2018 — A Baltimore-based nonprofit is working with U.S. Cyber Command to bring business, government and academic leaders together to work on new technology. Our next DreamPort Coffee and Conversation event will be Monday, May 13th and May 27th next month. This event is held every 2nd and 4th Monday of each month from 7 – 10am (barring holidays), nd is a great way to interact with DreamPort and USCYBERCOM staff, as well as to network with your colleagues! The format is free-flowing conversation, with no formal presentations. As always, there is no need to register. We hope to see you there! You can see the following events and more on our calendar. In September 2018 we conducted RPE-001 titled 'The Chameleon and the Snake'. While we were very excited to put on this event, as our first RPE it only focused on Windows tools and techniques for signature measurement and diversity. The online world does not take place on Microsoft Windows alone. Defenders must integrate, support and protect other operating systems and hardware on today's networks and so will we. On May 21 - 23, we are going to conduct a similar RPE where we pit offense versus defense but extend out the possible targets to include Linux and Android. We reserve the right to include iOS and OS X samples with time permitting. This means that the malware samples to alter may include scripted code such as Python. Read more here. This is the second of two panels later this month to hear your ideas, solutions to the latest Challenge Problems. Have a solution, a tech talk, demonstration, or an idea? Then please register and bring it to the panel on April 24 from 9-11am! Note: These are a repeat of the same panel, so you only need to register for one. Register. Join us for some hands-on workshops with Elastic experts. You'll practice using the Elastic Stack to create stunning visualizations, hunting for security threats, and using machine learning features to identify anomalies in your security data. From learning how to write simple queries and create impactful Kibana visualizations to participating in a guided hunt to master threat hunting best practices, you'll leave with new insights into how you can leverage Elastic tools to hone your security practices. This is a BYOD event. It will be held on April 26, 2019 from 8:30am - 4:30pm at the DreamPort facility in Columbia, MD. Food and drink are provided. There is no charge for this event. Read more here. Kevin McPeak is Symantec's Principal Cyber Architect for the US Federal Government will discuss how to apply Zero Trust tenants to address the modern threat landscape. The model advocates a holistic approach to information security and puts special focus on processes and technologies that secure your data, wherever it resides. This event was held on April 18, 2019 from 1 - 3pm at the DreamPort facility in Columbia, MD. Read more here. This is the first of two panels later this month to hear your ideas, solutions to the latest Challenge Problems. Have a solution, a tech talk, demonstration, or an idea? Then please register and bring it to the panel on April 17 from 9-11am! Note: These are a repeat of the same panel, so you only need to register for one. Read More. The Red Hat OpenShift Bootcamp is all about Containers, DevOps, & Agile Development. Attendees will learn, hands on, how to create, develop, use, deploy, and access containers as DevOps & Agile Development tools. The Red Hat OCP Bootcamp is a BYOD event. This event was held on April 11, 2019 from 3pm - 7:30pm at the DreamPort facility in Columbia, MD. Read more here. In this workshop, you learned to build a Secure Software Factory for a Java based website leveraging several containerized tools such as Gogs, Nexus, Jenkins, Sonarqube, and Che hosted on the OpenShift Container Platform. It was held on March 7, 2019 from 3pm – 7:30pm at the new DreamPort facility in Columbia, MD. Read more here. How difficult is it to actually find a needle in a haystack? We are going to find out. On February 26-28, DreamPort plans to execute an RPE competition where participants design and implement a solution for automatically identifying the most important assets (needles) on the DreamPort HQ network (haystack) without any prior human knowledge. HQ is the network we used and will continue to use in multiple RPE. Our ideal candidate solution must be able to monitor a network via packet capture (PCAP) only, and automatically identify critical computers or endpoints on the network. Read more here. The Fables of Aesop by Joseph Jacobs published in 1894 includes the tale of the wolf in sheep's clothing. Just as in this tale, DreamPort is playing the Sheperd trying to spot the wolf in the flock. DreamPort plans to execute an RPE competition where participants design, implement or enhance user activity monitoring (UAM) solutions for detecting live and recent insider threat attacks or unauthorized activities. DreamPort is interested in identifying UAM solutions that employ advanced real-time analysis of multiple data sources for detecting unauthorized activities. Read more here. Ansible Tower will enable you to create playbooks, while building in security. Automation features will save time, empower junior staff, offload senior staff and automate your most tedious tasks! Ansible Tower will enable you to create playbooks, while building in security. Automation features will save time, empower junior staff, offload senior staff and automate your most tedious tasks! Read more here. On January 28th, DreamPort hosted the Zero Trust Technology Showcase to discern and pilot how zero trust strategies and technologies can help the US Government protect their networks and data. Read more here. State-of-the-Art cybersecurity is enough to safeguard our Internet treasure against most threats, but not against all threats. Read more here. Adam is a founding employee and VP of Intelligence at CrowdStrike Inc., a global provider of security technology and services focused on identifying advanced threats and targeted attacks. Read more here. "The Chameleon and the Snake" specifically targeted malware signature diversity and signature measurement for Microsoft Windows (x86 and amd64) in a simulated operational environment at a realistic pace. Read more here. The Red Hat OpenShift Bootcamp is all about Containers, DevOps, & Agile Development. Attendees learned, hands on, how to create, develop, use, deploy, and access containers as DevOps & Agile Development tools. Read more here.